Office Pride’s standard/basic restroom cleaning process is pretty meticulous. 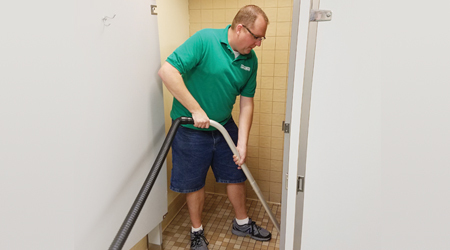 During every service visit, technicians stock the dispensers, dust, sanitize individual areas such as countertops and toilets, and mop the floors. Walls and partitions are wiped down weekly. The service frequency depends on the facility and contract, but this can be anywhere from once a week to seven days a week, says Hyde. And all of this is done by hand. With the touchless process, technicians use a disinfectant spray on all surfaces — floors, countertops, walls, partitions, toilets, mirrors, etc. (everything but the ceiling) — leaving the spray to sit for at least 10 minutes, during which time the dispensers are stocked. Then, once the disinfectant has had time to work, the technician high-pressure rinses the surfaces with plain water, or if it’s an environment that needs to dry quickly, a rinse product is added to speed the drying process. For the final steps, the technician squeegees the countertops and other surfaces and then uses a wet/dry vac on the floors. If there’s still some surface dampness, the machine allows the technician to blow air on the surfaces. The same machine is used for every step, says Hyde, describing this as an “all-in-one setup.” Most of the franchises use Kaivac equipment, but some use machines from Windsor or Advance. 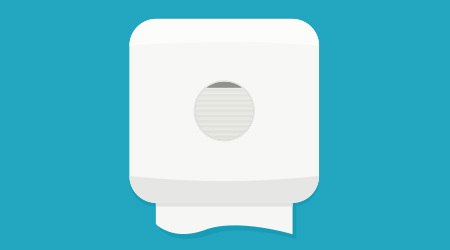 A restroom cleaning machine delivers a much deeper, more thorough and sanitary cleaning than can be done by hand, enabling technicians to touch — by not touching — all surfaces. It is also far more effective at removing the gunk that collects in the grout, mineral deposits and rings around faucets and toilets, the various stains and grime that clings to walls and partitions, and all the dirt not easily removed with towels and wipes. Odor control is also vastly improved with these machines (recurrent odor problems from chronically poor servicing is a common complaint Hyde hears from prospective customers). The process is significantly faster as well, drastically reducing the time required to clean, particularly in larger environments. For example, using the traditional by-hand method, a school restroom may take about 45 minutes to clean, says Hyde. However, with the touchless system, the same restroom can be cleaned and reopened in about 15 minutes. A stadium restroom that takes two or three hours to clean can be finished and back in business in about 35 minutes.